Talk about being your brother's keeper. 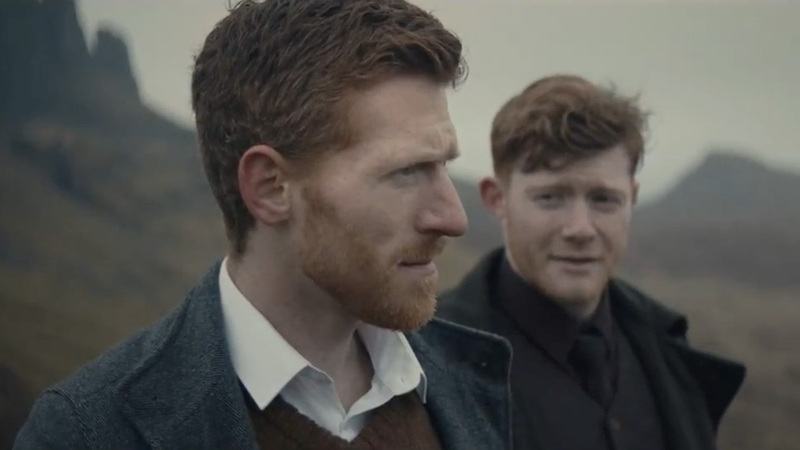 This haunting Johnnie Walker spec ad from Germany explores that concept in highly memorable fashion—delivering one of the most potent punch lines of the year. Two brothers traverse the fog-kissed, craggy terrain of Scotland's Isle of Skye—their childhood home, apparently—as a voiceover poetically recounts their experiences and depth of feeling for each other. The notion of "freedom," and "being free," surfaces several times as they climb rocky hills and gaze over twisted landscapes as desolate and awe-inspiring as the mountains of the moon. Reaching a dilapidated farmhouse-type structure, they share some Johnnie Walker, then continue on to a desolate peak overlooking the sea. Watch "Dear Brother" below before reading further. Whoa—to die for, right? Killer! Sure, it's a Sixth Sense riff nearly a generation after the fact, and also vaguely reminiscent of surprise endings like the one in that Robinsons juice spot. Still, the ad masterfully tweaks a somewhat familiar twist into something truly special. The heartfelt vibe and evocative imagery over its 90 seconds keep the finale from getting overly maudlin. Some might say the denouement verges on parody or dark humor—but skirting such territory gives the film extra dimension. Plus, the notion of a physical and spiritual journey exploring what it means to be "free"—for both brothers, in this case—powerfully distills the essence of Johnnie Walker's "Keep Walking" mantra (which flashes on screen at the film's conclusion). In fact, "Dear Brother" takes this conceit down a whole new road. We raise a glass to directors Daniel Titz and Dorian Lebherz! AdFreak: Why do spec on such a grand scale? Dorian Lebherz: We wanted to create an emotional film that tells the story of two brothers that go back to the most important places of their youth. We love to connect emotional storytelling with great cinematic pictures. So we followed the two brothers on the paths of their youth through the Scottish highlands. We tried to integrate the brand. The story itself is based on the message "Keep Walking." That's quite a surprise ending. The twist at the end of the film is to surprise the viewer about the fact that the brother isn't here anymore and to recreate the feeling of somebody missing. That is also the reason why we tried to keep the one alive always with a slightly sad attitude and to frame the picture so that it would work without the dead brother. Nearly everybody has been to the point that you've lost someone, so everyone can empathize with the feeling of our protagonist. It's the memories that keep those persons alive. Have you shown it to the brand? We love the old advertising message "Keep Walking." It says don't stop until you reach your goal. It stands for the effort that somebody puts into something, and that is what made the brand big. But Johnnie Walker lately changed their message to "Joy Will Take You Further," and produced a film with lots of different situations of people climbing or going by hot-air balloon. We think that a visually told story that creates emotions is always stronger than just showing different settings without storytelling. So we haven't showed it to the client yet. But we are thinking about it. Describe the challenges of shooting on location.